“Hey there, Steph! This is …” began a voicemail that grabbed my attention as I recognized the voice immediately. Once a boyfriend and now just a “friend” on social media, Fred had a special place in my heart. He was my first. My first love, my first…well, you know. Listening to the recording, I struggled to decipher the rest of the message to only pick out portions, “I’m sorry…. I should’ve told you months ago…..Bye.” No matter how many times I listened, I could not hear what he had to say. While trying to figure it out, I got lost thinking about our shared history. Our relationship had been brief and awkward. He had a life of privilege filled with material wealth. My life had neither. The only thing we had in common was where we attended school. Even that was due to his transfer from the public school in his neighborhood to that in mine. If I remember correctly, that is how we met. Every morning, on his way to school, he drove through my neighborhood. Most times, he would pass me as I walked to catch the bus. After a couple weeks of this routine, he tapped his horn as he passed. A simple “beep, beep!” from a teenage boy seemed like an innocent “hey, there!” to this naive girl. Eventually, his daily greeting included a smile and a wave and an actual “hey, there!” hollered out his window as he drove by. It didn’t take many more passes before he stopped and offered me a ride to school. There begins our story of an odd-alcohol-induced-but-basic version of boy meets girl. I now realize that whole scenario sounds creepy now, but in the early 80s it was the stuff of idyllic teen dramas. I’m not one for reliving my teen angst, so I will spare you the drama or even a John-Hughes-like version. 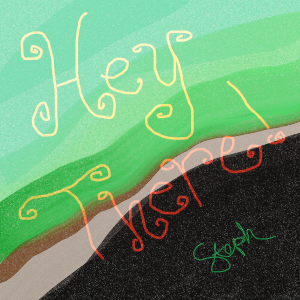 I doodled “Hey There!” using ArtRage on laptop. This graphic is simple because my hands are swollen and cramped this morning. Trying to draw using a clunky old mouse is bit painful. Typing out the story? Not so much. *His name was not Fred. I was drawn right in… an 80s teen, myself. 🙂 Thanks for a quick Sunday story! Found you via Blogher/NaBloPoMo. p.s. ~ Crayons have been making an appearance in my life lately, for a reason I haven’t yet figured out. I believe in signs and I’ve now had four (involving crayons), five including your About Me bio. As a writer, I know there’s something to it (she says, with eyes open and ears tuned). Oops… an extra “I” in there.. old eyes! geez. ← Don’t you see it?